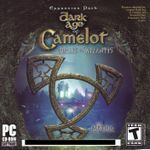 Dark Age of Camelot is a 3D medieval fantasy MMORPG that revolves around war between three realms following King Arthur's rule. DAoC includes both player vs. environment and Realm vs. Realm combat. Players can choose to adventure alone or join groups. Players may also join battlegroups, which are formed so all members can get completion credit in large scale PvE encounters and for communication purposes in RvR. Player vs. player combat takes the form of Realm versus Realm, a term which DAoC invented. RvR restricted to a limited number of zones where action ranges from massive battles to one vs one fights. Players are awarded points, which are used to purchase additional abilities, by killing enemy players. Participating in RvR combat is strictly voluntary in DAoC and free for all PvP only exists on a dedicated server. PvE focuses on defeating monsters found in dungeons, the open world, and RvR zones. Players earn experience points towards obtaining levels by killing both monsters and enemy players. Gaining levels yields new skills, abilities, and access to expansion areas. The current maximum level is 50. Expansions to the game offer alternative advancement type levels that grant additional abilities to level 50 players. Source: Wikipedia, Dark Age of Camelot , available under the CC-BY-SA License.